We really don’t need presents - having all our favourite people make the (not inconsiderable) effort to get to Yamba for our wedding is enough of a gift in itself! we have online registry with The Wedding Nest. 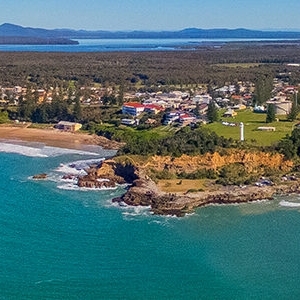 Yamba is a coastal town in northern NSW, situated at the mouth of the Clarence River. Laid-back, charming and popular with holiday-makers, but more low-key and undeveloped than Byron. It is the proud home of 'the best pub in Australia', and if you can find a better prawn this side of the equator, Willy will eat his hat. Yamba is approximately 7.5hrs drive from Sydney, and about 3.5 hours from Brisbane. You can fly to either Ballina Byron on Jetstar, Virgin or Rex; or to Grafton with Rex only. Ballina Byron Airport is 1.5hrs from Yamba, Grafton is 55 mins. Please be aware that flights to Grafton can often be expensive with Rex! There is a shuttle from Ballina to Yamba that runs regularly. Check the timetable and book tickets here. You can catch a train and bus from Sydney (via Grafton) to Yamba. It’s a long old trip (about 11 hours!) so let us know if this is looking like your only option and we’ll see if we can help organise a lift. we recommend booking accommodation as soon as possible. We have made some group reservations at the following places; please call and mention Henry & Georgia’s wedding to secure a room. All of these are within very short walking distance to Main Beach and the Surf Club. 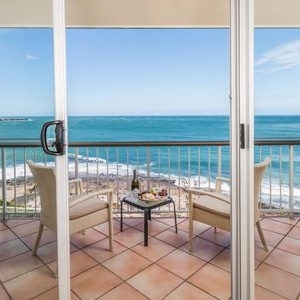 There are fantastic holiday house accommodation options in Yamba and again, all super close to the venue! Try the following sites as a starting point. For a more extensive shop, there is a Coles at Yamba Fair, which is just off the main road as you come into Yamba. There is also a Country Target in this centre. The Seafood Co-op is next to the petrol station on the main road into town, and has the best prawns (there is a good seafood shop in Yamba as well). Good coffee and breakfast close the Main Beach. Great for breakfast, lunch and arvo cocktails. Henry goes here for coffee. Delicious gourmet pizzas and pastas for takeaway or delivery. ANZAC Day celebrations and the wedding recovery on Saturday will be here. Wedding and reception will be held here! Small and cute, just around the headland from Main. Great for tanning and people watching. A short drive from Yamba, visit Angourie Point and Back Beach for untouched natural beauty and the best waves. Drop into “Yamba’s Fisho” for the best, famous Yamba prawns, take them to the beach with a couple of sundowners. A walk around the lighthouse, down to Turners Beach, along the break wall. Children are welcome at the ceremony but the reception is adults-only. If you are interested in babysitting services in Yamba let us know. What does ‘beach cocktail’ mean? Chinos, shirt and jacket for men, party outfits for women. We really just want you to be comfortable and enjoy yourself! Yamba in April should still be warm in the afternoon for the ceremony, but it will most likely be cooler in the evening. Where on Main Beach is the ceremony? When you arrive at the Main Beach car park there will be signs directing you down the stairs that lead to a grassy area on the right hand side of the beach, as you look out to sea. The ceremony will be held here, not on the actual beach (no sand to worry about!) There will be seating and shade. How far is the Surf Club from Main Beach? About 40 meters. You can see the Surf Club from the grassy area where the ceremony will be held. Please refer to the map to get an idea of how close everything is. What is parking like nearby? There is parking at Yamba Main Beach Parking on Queen Street, on the cliff above Main Beach, as well as street parking on Clarence Street. The day before the wedding is obviously ANZAC Day—we have not organised any formal festivities but plan to be at the Pacific Hotel enjoying a few rounds of two-up after our morning swim. Bridal party and family will leave the pub in the afternoon for our rehearsal dinner, and to rest up before the real party on Friday! Please join us for a recovery at the Pacific Hotel on Saturday from 12pm. Bring your favourite party/Hawaiian shirt (this may be the same item) and enjoy the morning-after debrief over a schooey and a view. If have already responded and can still come, you will not need to RSVP again when you receive your formal invitation. Please let us know by 5th March 2019 if you cannot attend. I/we will be there with bells on! If attending, please provide your mailing address so we can send you a printed invite!